We designed our first website in 1995 and offer experience and perspective to help maximize your web presence. Contact us about consulting fees. Addressing the #1 Patient Complaint — my doctor is late! 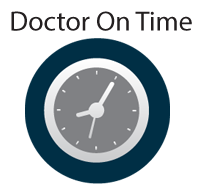 Doctor on Time — Provides Real Time Appointment Status. A simple, low-cost, web-based solution that provides real-time appointment status. improves patient satisfaction. Easy to use – for both doctors and patients with any internet connected device anywhere, including smartphones, tablets or iPads. Web-based – so patients are motivated to visit your site to access their appointment status. Doctor controlled – so each doctor in the practice can opt-in or opt out. Greater patient satisfaction – contributes to improved doctor/patient relationships, patient compliance, and better outcomes. Less stress – for the doctor and office staff with a less crowded waiting room. The doctor controls what is displayed on his webpage by clicking radio buttons on a secure page, which takes only seconds. The appropriate text is displayed immediately and clearly, so patients can view the time adjustments to minimize waiting. Websites with this feature are perfect for any profession that schedules appointments and wants to notify patients when running behind schedule. Our unique Doctor on Time feature puts your status online in real time. Changing your status takes seconds and can be set from a smartphone, tablet or computer. We developed a unique ‘Doctor on Time’ feature that notifies your patients if you are running late. This solves the #1 complaint “my doctor is late!” It has been spotlighted by the CPC — Comprehensive Primary Care initiative of the Center for Medicare & Medicaid Innovation. Patients love it. It makes the waiting room less crowded. And it helps the physician to be less stressed. We provide patient handouts that explain how to check the site to see if the doctor is running late. I redesigned a website and explain this feature. See a video demonstration. For a complete explanation. Download this PowerPoint presentation. * Per physician additional physicians are discounted. Contact us for more information. We will advise you on these topics. Most searches are limited to the first page of search engines. We can assist you to rank higher with the content building strategy for natural listing improvement, or help with a pay per click advertising strategy. We connect you to medical and important online business directories that act as referring sites. A growing number of people (over 40%) surveyed said social media impacts what healthcare provider they choose. Reach them with Facebook, Twitter, and blogging options. We have a strategy to promote positive reviews on google and other sites. Potential patients who are searching for a doctor in your area are strongly influenced by the feedback and ratings others give your practice.